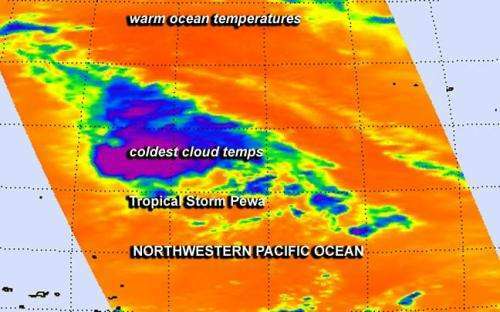 Cloud top temperatures warmed up on NASA infrared imagery, indicating that the uplift in Tropical Storm Pewa was waning. By Aug. 23, Pewa was reduced to a tropical depression. Infrared imagery also showed that wind shear has pushed Pewa's precipitation away from the storm's center. On Aug. 22 at 01:35 UTC (2:53 p.m. EDT) NASA's Atmospheric Infrared Sounder or AIRS instrument that flies aboard NASA's Aqua satellite showed a limited area of cloud top temperatures in bands of thunderstorms east of the center of Tropical Depression Pewa were as cold as -63F/-52C, indicating strong storms. Satellite data indicated that Pewa's low-level circulation center is partially exposed to outside winds and wind shear continues to push the bulk of precipitation east of the center. AIRS infrared images are false-colored to show temperature differences. Scientists look at cloud top temperatures to understand how high the thunderstorms are that make up a tropical cyclone - and there are hundreds of thunderstorms that make up one storm. The colder the cloud top temperature, the higher the top of the thunderstorm reaches into the troposphere and the stronger the storm. NASA research has indicated that cloud top temperatures that reach or exceed the threshold of -63F/-52C typically have heavy rainfall rates. On Aug. 23 at 1500 UTC/11 a.m. EDT Tropical Depression Pewa's maximum sustained winds had fallen to 30 knots/34.5 mph/55.5 kph. Pewa was centered near 26.9 north and 168.5 east, about 458 nautical miles northeast of Wake Island. Pewa is moving to the northeast at 4 knots/4.6 mph/7.4 kph. Forecasters at the Joint Typhoon Warning Center expect Pewa to turn back to the northwest and continue on a northerly track over open ocean. The Joint Typhoon Warning Center noted that Pewa is expected to struggle over the next several days is it moves in a northerly direction. Pewa is also expected to become extra-tropical over the next couple of days.